I have two strategies for finding good restaurants, which I use often—especially when traveling. I’ve never, ever been steered wrong using them, and I’m happy to share them with you. One method I employ is to walk into a fish market and ask them where to eat. Fishmongers always know where to find food that’s impeccably fresh and those strapping young men never fail to steer me towards the best addresses. The other method I rely on, if it’s lunchtime, is to walk around and see what restaurants are packed-full of older businessmen. Most often they’ve worked in the neighborhood for a long, long time and have their favorites—which is usually because of the good food. Such was the case the last time I ate at A la Petite Chaise. 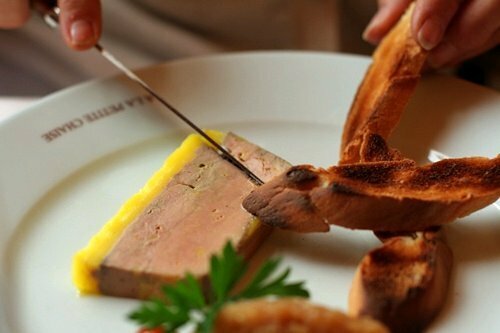 The menu features textbook-perfect examples of French classics: slabs of foie gras, escargots, French onion soup, and salads of boudin noir with a big pile of fresh greens. For main courses, my dining companion had a seafood choucroute; an enormous heap of sauerkraut with various pieces of fish and a creamy beurre blanc sauce (who said fish had to be healthy?) Even though it was a warm spring day, I had to order the pot-au-feu. Looking at the classic, hunched over, flat-footed waiters, I knew the version at A la Petite Chaise would be perfect. And my hunch was right: three giant slabs of very, very tender beef, honest-to-goodness fresh vegetables, (not canned or frozen, which is sadly, sometimes the norm) and a lovely broth were set down in front of me. The accompanying Dijon mustard, cornichons, and coarse gray salt were put to good use on everything. I was happy. The house Sauvignon blanc from the Touraine was fine, if a bit neutral, but we agreed the Burgundian Chablis by the glass was much more inviting. The €20-€33 pre-fixe menu included a glass of any wine at lunch, as well as coffee. At dinner, those are extra. By the time dessert rolled around, we were ready to be rolled out the door, so we passed on the crème brûlée and the bitter chocolate cake, in lieu of the coconut flan with ultra-dark housemade chocolate sauce, which was cool, creamy and delicious. There’s also ice cream and sorbets, but we’d had our fill. At least for one meal. The restaurant is open every day of the week, which is great if you’re looking for a place for Sunday dining. In addition, I just had a nice lunch at Bistro Volnay (8, rue Volney, 2nd, tél: 01 42 61 06 65), a new restaurant and wine bar in an area not necessarily known for especially great dining (example: the “American Dream” restaurant, just around the corner.) But at lunch, the place was also full of businessmen. The food was fine, but the wine list was terrific. There’s a €24 lunch menu (un plat, a glass of wine, and Illy coffee) or a €33 three-course prix-fixe. The engaging sommelier put together a list of somewhat unusual wines, many for just €3 a glass. She spent a lot of time talking to us about the wines, and I had a lovely Juraçon, rich and minerally and slightly exotic, an unusual and perfect choice with my garlic and butter-braised razor clams. If you find yourself in that neighborhood, it’s the perfect place to stop in for a bit of charcuterie, including Spanish ham and chorizo, along with a glass of wine, or two. You know, I just so enjoy your stories. As if you didn’t know you had a vast, admiring audience. Just had to tell you. Again. The photos from this post are profoundly clear, enticing, bright and just plain perfect! Perhaps I’ll get over my shy quiet French and walk into this wondrous place in a few days. Merci! Aha! 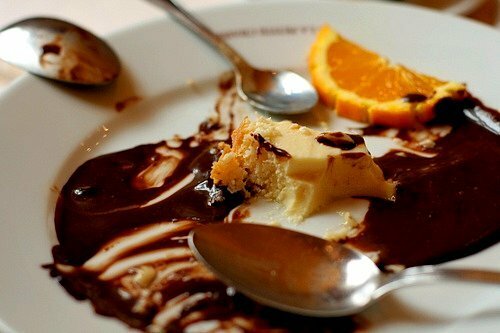 That dessert shot is evidence that you sometimes violate your own no-sharing dining policy. Good for you. And now I’m craving cornichons. Thanks. Good tips, appetizing photos. Here’s one more tip…even after you’ve done your homework and you’ve entered the eatery…pay a quick visit to the bathroom. It’s condition will tell what the kitchen is like as well. Smart! If this food thing fails, you could consider a career as a detective. My father was a Chef, and his trick was to walk into a restaurant, try to get as close to the kitchen as possible, smell the food, and if you can see the kitchen check to see if looks good, then it’s a GO! ; unfortunately, I have bad allergies, so my sense of smell sometimes malfunctions. Thanks for this…I live not too far from rue de Grenelle, so I’ll have to try it sometime. I checked out the menu on their website. The ubiquitous apple crumble certainly seems to be the hot new dessert in Paris! I think the older businessmen method works better in France than it does in, say, Los Angeles, where (a) you can’t identify the older businessmen because they’ve all had Botox and (b) they’re more likely to eat where there are hot waitresses than in the best foodie spots. Do you ever feel awkward taking pictures of your food? And businessmen are more likely to eat at the ultra-expensive trendy steakhouse which serves sub par steak at ridiculous prices, in order to show off how much money they make. Why go to the fantastic steak house accross the road when you can pay five times more and show off? thanks for the tips and the wonderful photos! You are my hero. Only you could post a picture of plates stacked up after a meal, food remnants and all . . . and may it look impossibly enticing and artful. I bow before you. Gosh David, I just love this read. It feels a lot like me for some reason – today. 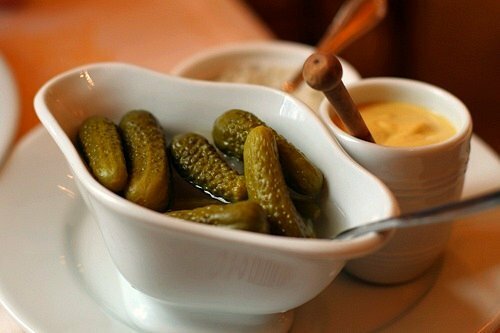 God I am totally coveting cornichons at the moment…you’re killing me. I’m pretty intrigued by the fish choucroute though, that I simply must try. 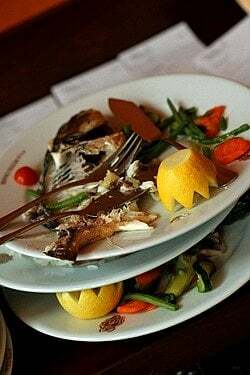 You’ve been responsible for a number of great meals we’ve enjoyed in Paris and I see a few more in our future — I’ve added this post to my “Paris files” — thanks! What an awesome way to find restaurants. I love that I can use this method here in Seattle too ( while wishing I was in Paris!). It looks like a most memorable meal. Did you save me a cornichon? So I’m curious: since most historians place the advent of the first restaurant somewhat later than 1680, what type of place was À la Petite Chaise originally? Their web site say wine shop that also served food. Are we talking the equivalent of the old saloon in American with the nickel lunch? Interesting! I was always under the impression that the Procope was the oldest restaurant in Paris, but this one claims to beat them by six years. I’d much rather go for ratty decor and good food than the mediocre food and blatant tourism of the Procope any day! Indeed. When we were in Paris, Ronny & I just walked into a restaurant that was pretty crowded with older Frenchmen in it and we weren’t disappointed. Sometimes you can look into a restaurant and feel good vibes coming from it (or bad ones!). Thank you for the tips! I’m always trying to improve that skill. I try to find a place that is packed with both white and blue collars. If businessmen and lawyers are vying with cops and taxi drivers for a spot, it’s always good. Outside of big cities, just check the parking lot for a BMW parked next to a Ford truck. Hé hé, I hope it was a proper French restaurant toilet, set at a peculiar angle to the walls in some irregular shaped corner that could not be used for anything else? Great post David, now I know where I’ve been going wrong all these years! oh, we’ve been following French businessmen for decades! Great way of finding good-value restos for lunch. There have to be at least 2 of them together though, and 3-4 seem to be better. The more briskly they are walking the better — they must be hungry! This doesn’t work in Spain. We’ve had bad results following locals, and good ones following tourists. David, your writing always has the power to make me wish I was in Paris right this minute. 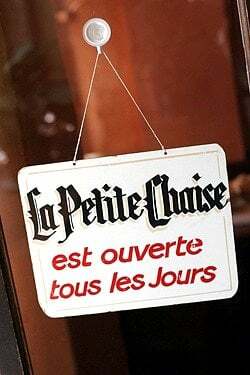 (my best Veruca Salt voice) I want to go to A la Petite Chaise! Also, that lovely article on things to do in Paris with children just about had me buying plane tickets, I have an eight-year-old who is longing to go to Paris more than anywhere else in the world, even Disneyland. Thanks for all the great ideas you always share. I work in the Financial District in Manhattan, so up until a few months ago, all of the older businessmen were eating lunch at steakhouses that weren’t so easy on my pocketbook. But the turn in the economy means that they’re actually following me to my delis instead now. Oh, the humanity. You are sooooooo lucky to live in Paris. Thank you for the tip on how to spot a good restaurant. I would have unbuttoned and gone for the chocolate cake. I don’t think the businessman rule will work at all in London. Here, you find that most businessmen are eating in the city – one of the worst restaurant areas in London. They also tend to dine at the most corporate, stuffy and bland places. I was so excited to see this post on La Petite Chaise! I ate there with friends and family on a February night a couple of years ago. The food was great and I just remember having best time. Thanks for the memories. I ate in The Little Chair while in Paris…. I also went to Chez George also on Grenelle. Dorothy: I don’t spend a lot of times taking photos when I’m eating & I don’t let it interfere with my meal, or with others. I don’t want to spend a lot of time “getting the shot” just I pull out my camera, take a picture or two, then put it away. But I do like to be unobtrusive, as much as possible. Arthur: I also use it for airports–always eat where the pilots eat! Meg: So was I. But I think Procope is the oldest café, which is different, I suppose. (I think they began serving granita since the owner was Italian.) As a Francophone, you know that ‘restaurant’ comes from the word ‘restore’ so perhaps they were the first place to serve a meal? Hi, David: Once again, you have transported me from my cubicle back to Paris. This is especially welcome as we are finally expecting some nice weather here on the east coast this week-end. 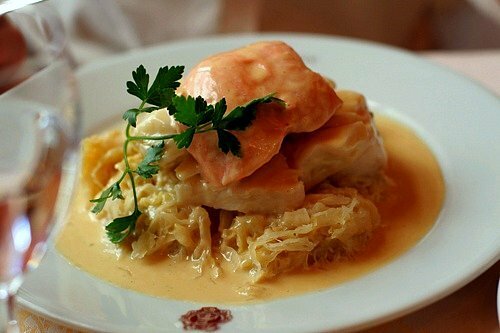 I hope not to sound like too much of a rube, but I’ve never heard of eating sauerkraut and fish together, although that plate looks fantastic! I am living my life vicariously through this website! I only visit two sites with religious fervor- my fitness instructor’s and David’s. My search for truth and beauty ends here. Fav pic is the waiter buffing the wine glass (nice linen); as I have done that about a thousand times. I’d put that photo up in my kitchen like fine art. Awesome photos, they simply draw one in….. I use a Canon Rebel, which I love. It’s small enough to carry in my bag and not heavy. And I love the pictures I get with it. You can read more at my post Food Photography Tips and Gear. 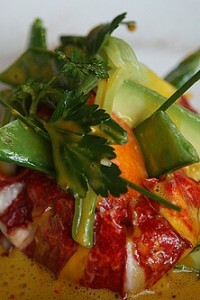 Lush photos and Boy could I go for that seafood choucrout right this minute! One little question about this interesting technique to find good restos.. Does that mean you walze in with no reservation? Or do you quickly call on yr cell and reserve a place? Or is none of the above is necessary at Biz mens favorites? thanks for the inside tips David!!! Parisbreakfasts: For lunch, most of the kind of places that I go to don’t take reservations. Or else if I’m traveling, I’ll reserve for that night. Although many restaurants in Paris do like reservations, for lunch, they’re not as critical like they are at dinner. Tell me about the coconut flan…Not much left in the photo to get the idea from! Custard base with lots of coconut, toasted or not?? Tell us more! 1.) Never eat at a restaurant that has the menu printed in 4- or 5 different languages. 2.) Never eat at a restaurant with flags from around world hanging on their awning. 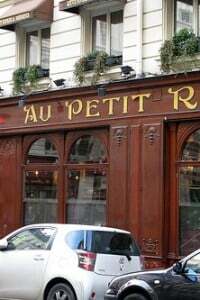 Funny, I used to pass by A La Petite Chaise on my way to Sciences-Po all the time – of course I was broke then and never got a chance to actually have lunch there. So thank you so much David for giving me an idea of what I missed! 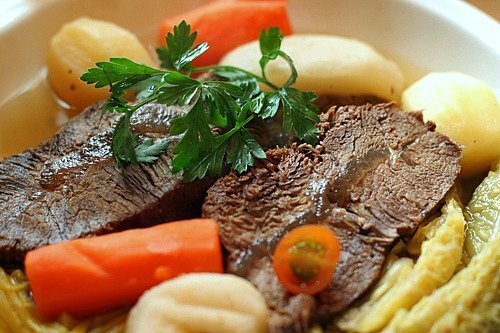 And of course now I want to rush back to Paris and eat there – or to Clermont-Ferrand and my mother’s Pot-au-Feu. Oh well. I am in the process of planning my first ever trip to Paris (just moved to the UK so Paris is like my new neighbour) and I’m planning to print out tons of pages from your blog to guide me. Gorgeous photos and story. Thanks for sharing so much about your life in Paris! Great restaurant tips! We used many of them in the past with great satisfaction. Our teenage daughter loved it as well and now we have a challenge: she is going to Paris with a group of 35 other kids and is looking for a place where they could have a French lunch/dinner. Apart from the number of them and need to be able to book table(s), the meal should also not be too expensive (let’s say 10-15 EUR). Is it mission impossible or could you help? I was invited for lunch at A La Petite Chaise and can attest to the tight fit in the men’s room. Don’t wear your favorite shoes. The food isn’t magnificent, but it’s perfectly good and as David points out, the dishes aren’t much different than what would have been served before WWI. That’s not a knock, just an observation. When we were there on a rainy November afternoon we dined with older French women and their even older mothers as well as a smattering of business folk. I have celebrated not one but 3 birthdays at a la Petite Chaise, including a very BIG birthday there in 2008. The waiter even presented me with a cake, complete with candle and sang Joyeaux Anniversaire to me, much to the amusement of the seated diners nestled so closely by. Our first visit back in 1996 was at the recommendation of the concierge at Hotel Cayre, where we enjoyed a magnificent fixed price menu and a bottle of Perrier champagne which cost more than our combined meals. We celebrated my birthday there again in 2005 and before my BIG birthday, a friend was also celebrating his birthday 2 days before mine, so we suggested we go there for his birthday too. We have always been able to reserve a table by booking early on the day and have never been disappointed with a meal or the service provided by this historic restaurant, although decor wise, it is a time warp in history.